I saw Finn speak today for the Ok. Talk. event hosted at Hel Yes! pop-up Finnish restaurant for London Design Week – super interesting guy, there are two more sessions that I highly recommend to anyone in the city this week. Stewart Brand's "How Buildings Learn"
is somewhat tangential to this issue of building expansion and spaces derived from user needs beyond the intended planning for such places. There was a post like this a while ago right? It included a plan to build an enormous home theatre addition onto a home? Anybody remember what/where that is? Jack, if you make it out to see the talk this coming week, let me know; I'd love to hear how it goes. Timothy, I think you might mean this older post? Scarlet, I'm a fan of Cirugeda's work, as well, and posted about him a few years ago. Great stuff. This reminds me of Roger Sherman's book L.A. Under the Influence. 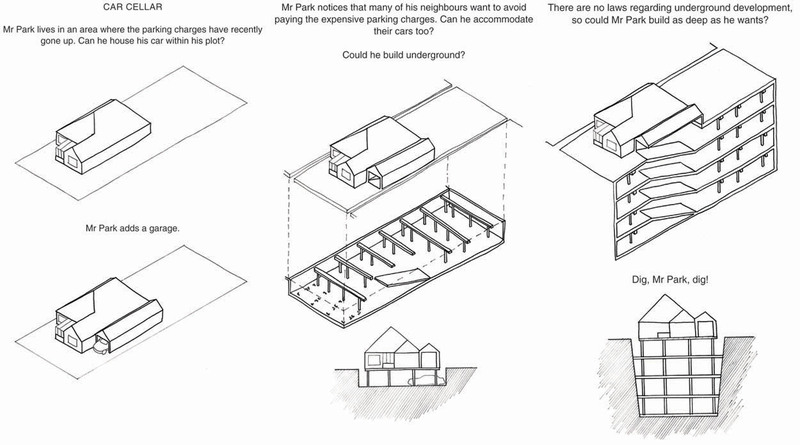 He examines how individual parcels are influenced by zoning and other "negotiations between stakeholders." Through some diverse case studies he basically elevates responses to these factors over formal architecture with a capital A. The book also makes a good alternative guide to LA, like Pet Architecture did for Tokyo. We live in a minefield of planning permissions – dodging them and looking for loopholes is a professional hazard. Unfortunately they are no guarantee of architectural quality under any circumstances – look at the endless housing developments that blot the landscape, the seriously unfortunate amateur add-ons dotted into the urban fabric. Zonings are not even curing crime or transport problems. Need to go back to what we need planning for……. As a small-time landlord, I'd definitely want to consult with a tenant before letting her do some of these things. However, I would not be intrinsically opposed to the idea, and I'd be happy if that were to remain an issue between myself and the tenant, rather than myself and all the different City departments which might get involved.